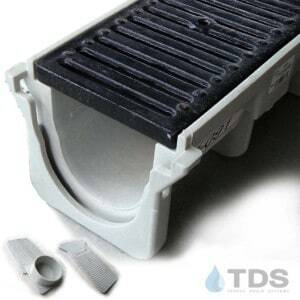 The 6″ Dura Slope by NDS® is one of the most customizable plastic trench drains available for commercial projects. A lightweight HDPE drainage system, NDS® Dura Slope sets high standards for chemical and load resistance. Its four foot modular channel sections offer 0.7% slope with rounded bottom, creating an efficient water evacuation route for any application. 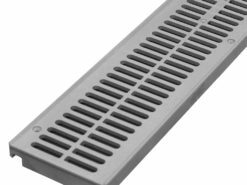 Each channel has a 4″ bottom outlet knockout that provides a greater degree of design variability for the drainage system. Dura Slope™ channels are designed with the Pre-installed ProFit™ locking system, which maintains structural integrity during installation and locking devices for the grating. LeveLoc™ integral re-bar supports are located at 24” intervals along each side of the channel and contain an internal protruding knob designed to grip #3 or #4 re-bar (3/8” – 1/2”) for easier channel height adjustment during installation. DuraLoc™ tongue and groove ends connect allowing for a precise fit and ensure straight channel runs, incorporating an integral snap-lock feature that prevents joint movement during channel installation. 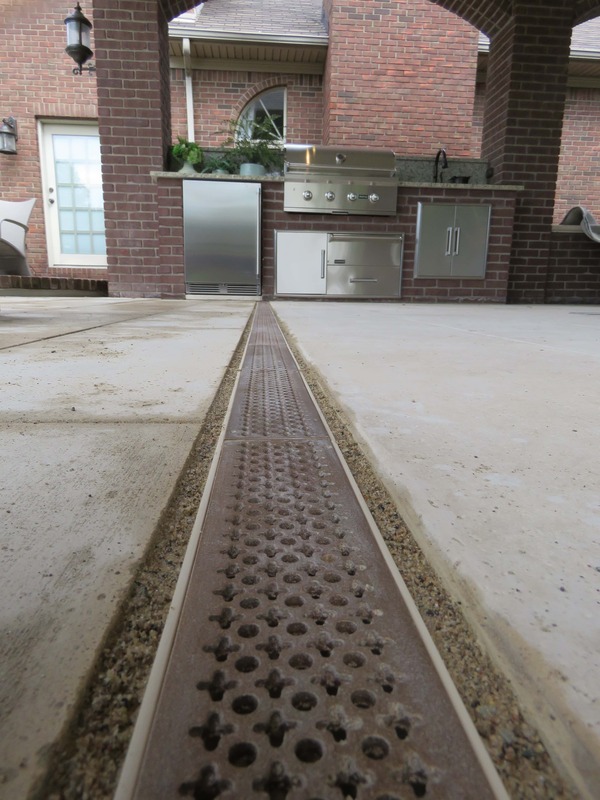 Want to know more about this drainage system? Click Here for more information. 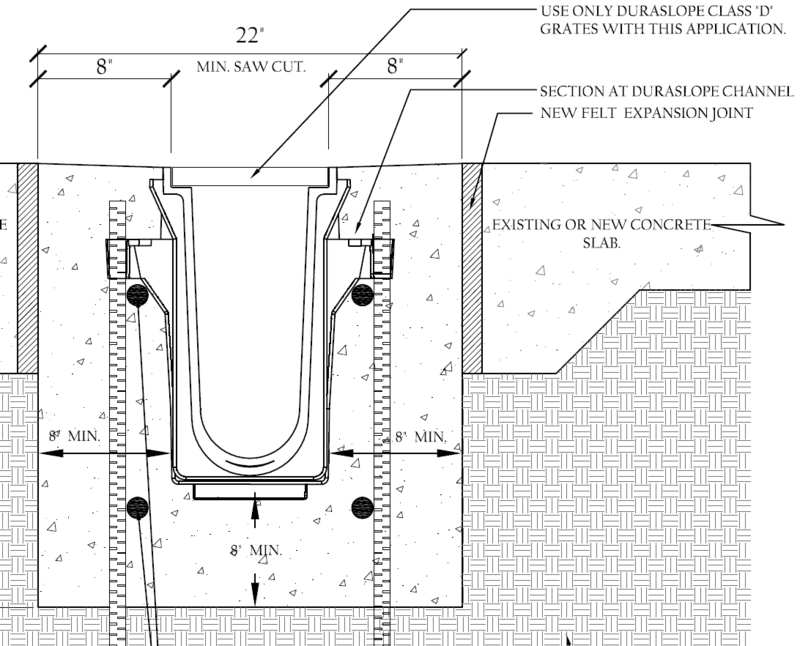 Before we can ship your Pre Sloped drain order, a layout will need to be approved by you. Once we receive your order, we will contact you via email with a layout drawing showing what channels you will receive and the order they need to be installed. We will need a confirmation email from you that you accept the layout. DrainageKits.com reserves the right to choose the channel depth of the channels you receive. If you have certain channels or a channel depth in mind, please note this in Order Notes at checkout. We will do our best to accommodate you if the channels are in stock. Channels are shipped with installation covers that are to be in place during the concrete pour.